RoboGEO's approach is "software only" and that makes it less expensive, more convenient, and more powerful than hardware-based products. Write the latitude, longitude, altitude and photo direction to the image's EXIF headers to permanently embed the location data within the actual image. The writing is lossless, so there's no loss of image quality. Export KML or KMZ files for display in Google Earth. RoboGEO's "KMZ for the Web" format creates very small KMZ files with embedded images that you can share with others by e-mail. Like with Google Maps, you can make full use of your EXIF and IPTC information in the image titles and descriptions. Since there's no requirement for loading images, you can also use this feature as your normal GPX tracklog viewer and you probably will once you see the results. 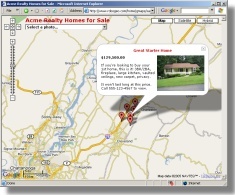 Create Google Map web pages (sample) with icons that show where each picture was taken. When these icons are clicked, additional info about the picture is displayed along with the option of viewing the full size image. You can even include the GPS tracklog on the map (sample), automatically use the EXIF and IPTC information for the image title and description or merge individual EXIF/IPTC fields for whatever use you require. Export ESRI shapefiles for viewing in ArcView. You can export point shapefiles that correspond to the geocoded photos, line shapefiles that represent the GPS tracklog, or both. You can also include any EXIF or IPTC field in the output. 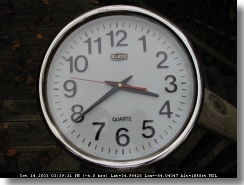 RoboGEO can automatically create a custom URL attribute for each photo. These allow you to easily share shapefiles without also having to distribute the photos. Export DXF files for most popular vector based drawing programs such as AutoCAD and IntelliCAD. The DXF files are AutoCAD 2000 format and contain clickable entities that allow you to easily view the photos. You can even include a GPS tracklog and represent it as a lightweight polyline on the drawing. The images can be located either on the local computer or on a web server. The latter allows you to easily share DWG files with others. 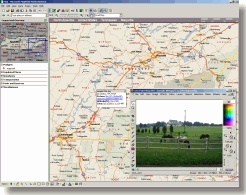 Export GPX files for use in other 3rd party GPS utility programs. 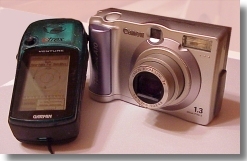 The photo locations can be exported as either a list of waypoints or as the basis for a route. You can also include the GPS Tracklog. The program writes the image file path to the waypoint's comment field, which allows for easy viewing. Upload your photos to Flickr, the internet's best photo sharing service. RoboGEO creates the Flickr geotags that allow you to link your photos to various types of maps (sample) using the Flickr2Map service. The Flickr Geo API is also supported which allows you to locate your photos on Yahoo! Maps. 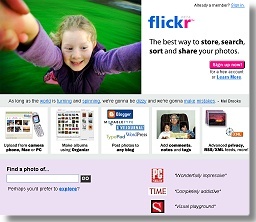 The SmartSet feature can automatically categorize your Flickr photos based on the keywords. You can also merge the photo's EXIF or IPTC information directly into the titles and descriptions. 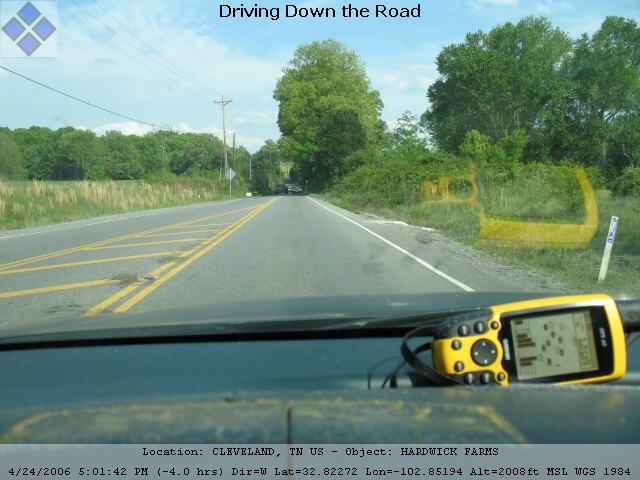 Export the geocoded photos and/or tracklogs to Microsoft's MapPoint or Streets & Trips. This will create pushpins in MapPoint that, when clicked, display the photo information and a link to load the full size image. This is a good alternative to Google Maps when you want the information to be available only to you and not to anyone on the public internet. 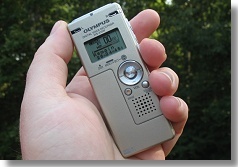 Using any modern digital voice recorder, associate audio files with the photos. Simply record the dictation after taking each photo and the program will automatically equate the two. 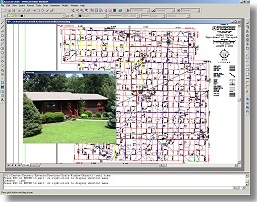 This functionality is independent of the program's geocoding capabilities, but you can still include the audio files in the Google Maps or Google Earth output if your choose. Want to know more? The program's documentation is on-line if you want to browse through it. Or better still, download the demo and try it for yourself. When you're ready to purchase, you can do so through our automated on-line ordering system. It'll only take a few minutes and you won't break the bank in doing so.